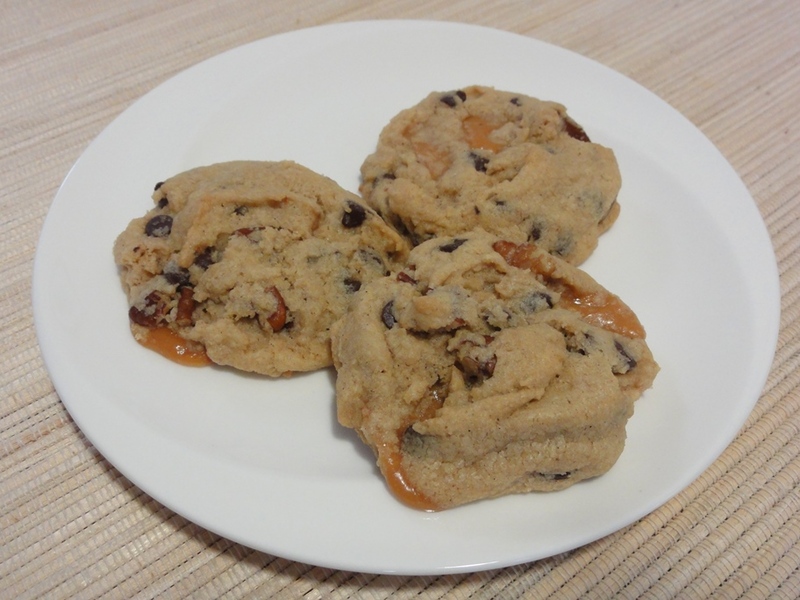 A few weeks ago when discussing baking with a colleague of mine, the phrase “chocolate chip caramel pecan cookies” was offered up. 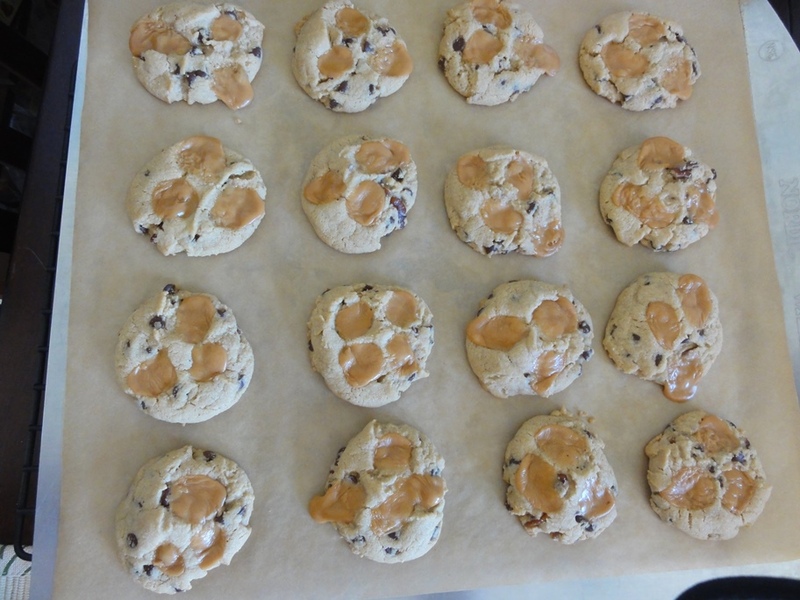 This was too tempting of an idea to pass on, so I searched around for a recipe that I liked the look of and settled on Sally’s recipe for Salted Caramel Pecan Chocolate Chip Cookies. 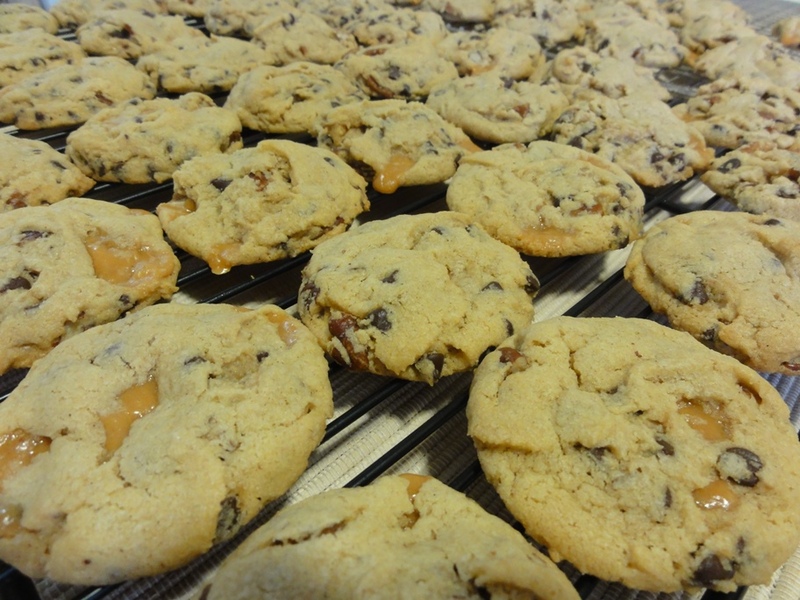 What I ended up baking was very similar to an older recipe I’ve posted up here for Salted Caramel Chocolate Chip Cookies, with only a couple of ingredients having different quantities and then the addition of pecans. Just like with those cookies these are delicious, and they have the advantage of the caramel ingredient being slightly easier to come by than the caramel chips. I’m also a fan of the addition of pecans, so I decided it was worth writing this up as a recipe in its own right! The differences between this recipe and the older one include less brown sugar and an approximately equal ratio of chocolate chips to caramels. 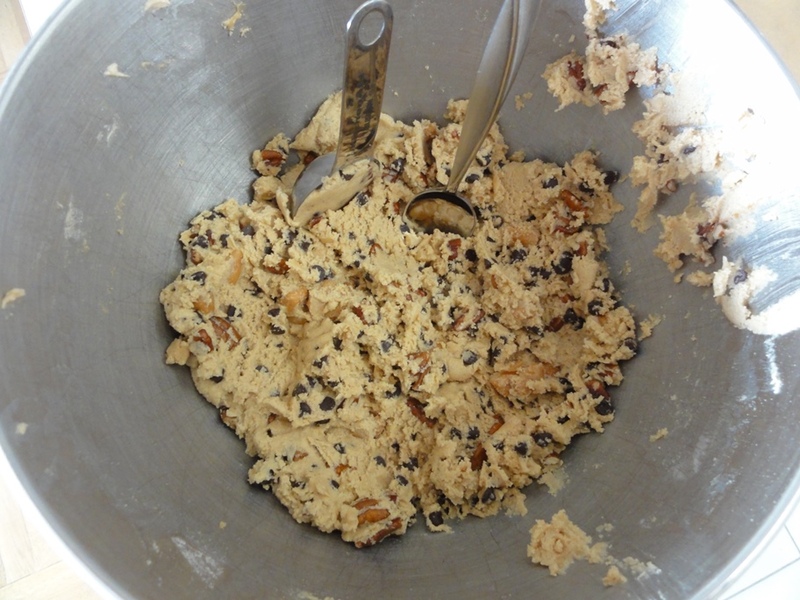 The chips, caramel, and pecans together add up to 2 cups, putting it above the quantity of “extras” in the older recipe. Then there’s the caramels themselves; this recipe involves buying caramel squares and chopping them into pieces, instead of buying conveniently pre-formed caramel bits. The advantage there is that caramel squares are much easier to find than the bits, but the disadvantage is that cutting them up is a very time-consuming activity; it took me about ten minutes to come up with a 3/4 cup of finely chopped caramel pieces. There is another advantage though in that there’s also variety out there in what constitutes a “caramel”, and I picked up some vanilla-flavored caramels that worked wonderfully in these cookies. 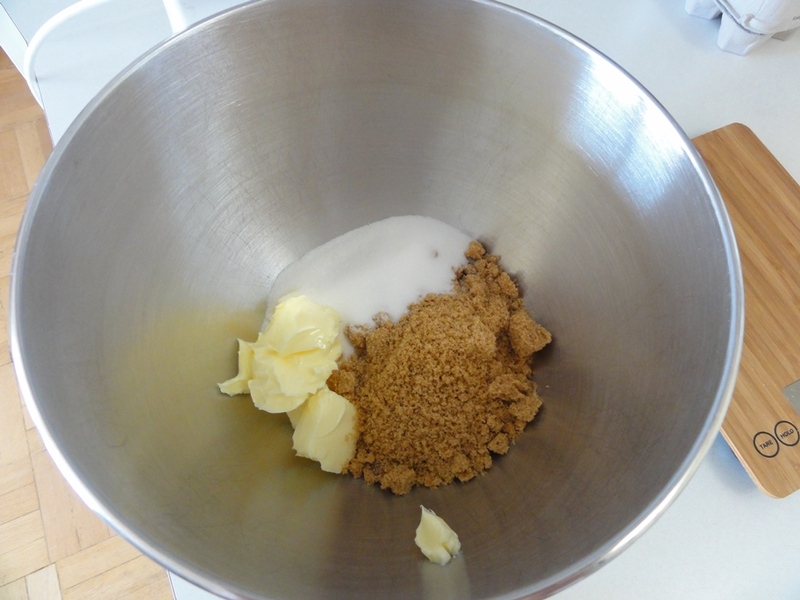 Cream the butter and sugars together until well combined; about 3 minutes on medium speed. Add the egg and vanilla and blend until well combined. Add the dry ingredients to the wet slowly, no more than 1/4 of the volume at a time, and blending until well combined each time. 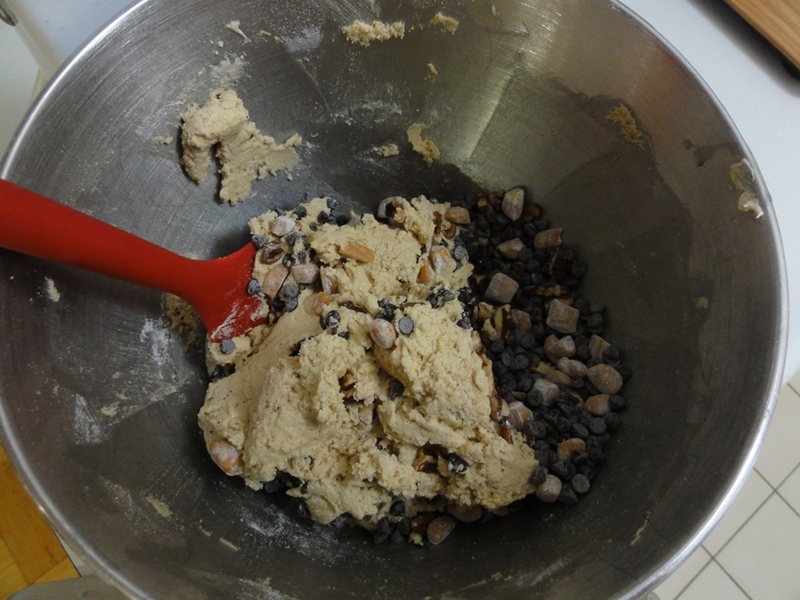 Fold in the chocolate chips, pecans, and caramels. Chill the dough in the refrigerator for 30-60 minutes. 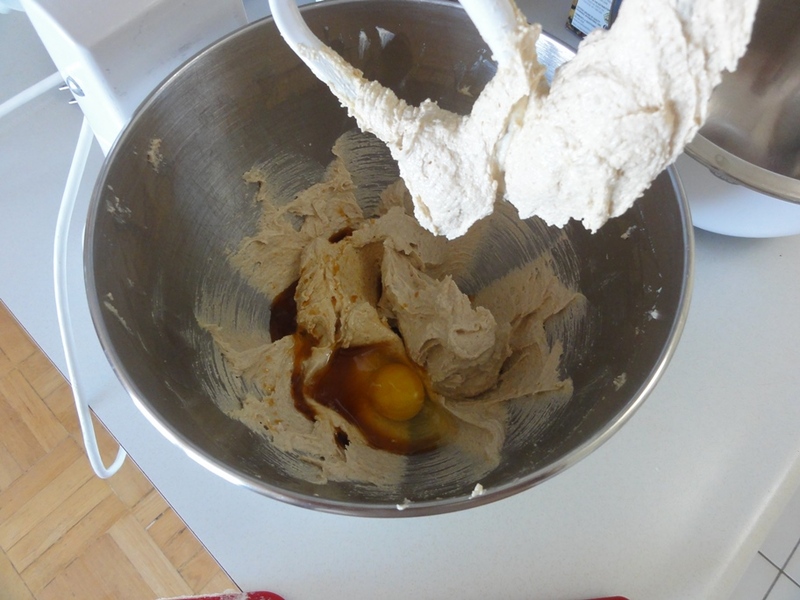 Drop tablespoon-sized amounts of dough onto the lined baking sheets. Bake for 8-10 minutes until the edges are starting to turn golden brown. 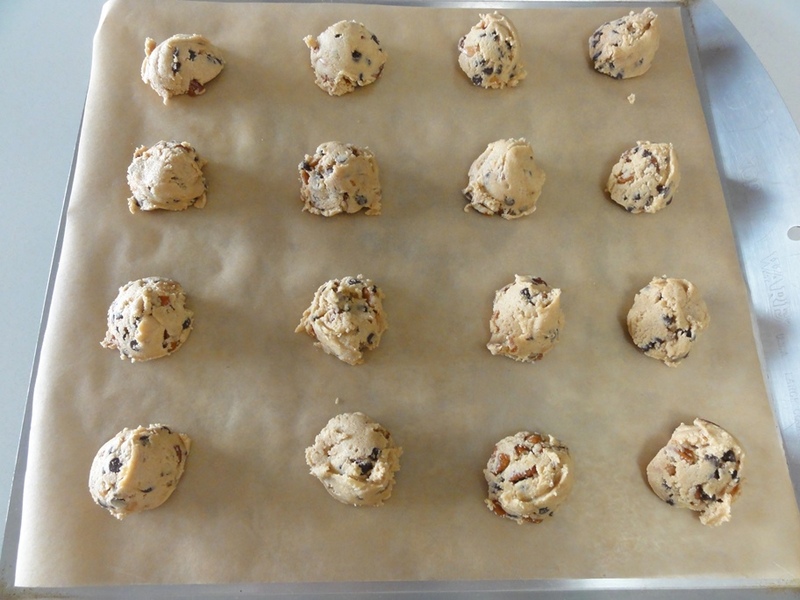 Let the cookies cool for 5-10 minutes on the trays and then transfer them to wire racks to cool completely. This is not necessarily a bad thing, and the folks who tried these cookies for me liked them like this, but from an aesthetic perspective I was happier with the result evidenced in the first photo up top in this recipe, which I got by folding the caramel bits in with the dough before putting it in the fridge. That step can be considered variable depending on whether you want pools of caramel buried within, or on spread top of, your cookies. 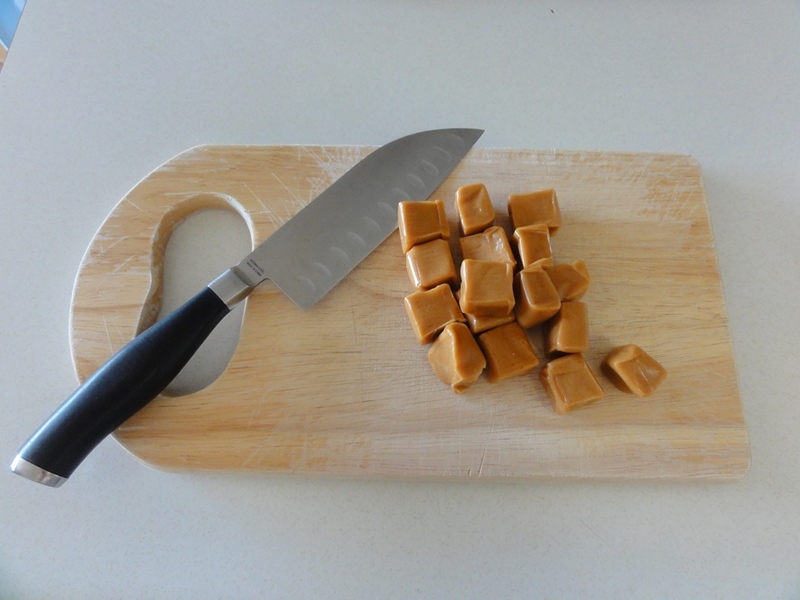 If you go with the choice of folding the caramels into the dough, see the photos below for a tip on keeping the caramels from melding together into a big mass while you’re working through the rest of the recipe. I also left out the big grains of salt on top that were in Sally’s recipe, because the original suggestion from my colleague wasn’t for “salted caramel” cookies, but by all means drop a pinch of large-grains of salt on top of each cookie, after dropping the dough on the cookie sheets, if you’d like that particular twist of taste. Chopping caramels takes time and it’s also a little messy. 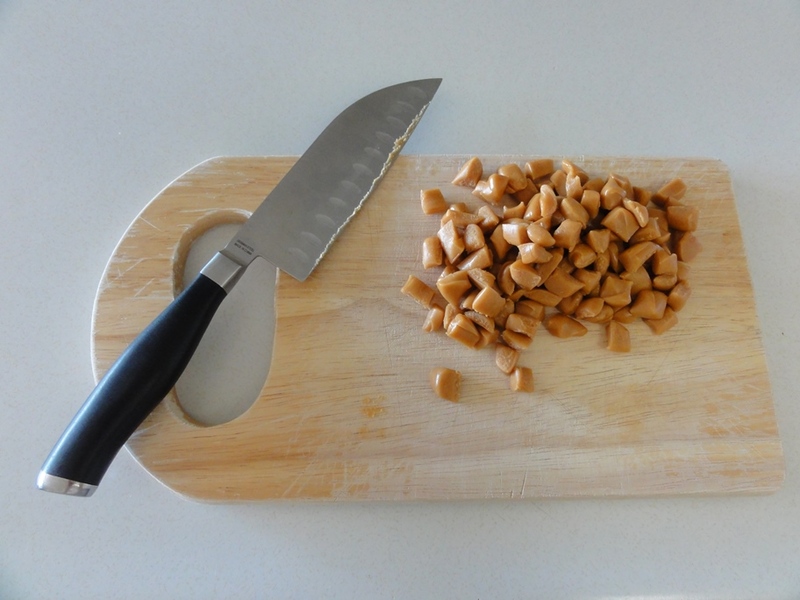 I found that after every 3 or 4 caramels my knife was squishing the caramels more-so than cutting them, so I started washing the knife repeatedly. That made the process take longer, but I got better results. On my first attempt at making these cookies I chopped up my caramels as above, set them aside, and got to work on the rest of the cookie dough. When it came time to squish caramel pieces into the tops of my cookies the pieces had become stuck together and I wound up having to pinch off pieces from the caramel blob and roll them back into suitably sized pieces; thus even more time was spent on the caramel pieces. For my second attempt, since I was planning to fold them in with the chocolate chips and pecans, I found that dusting the caramel pieces with flour worked great to keep them from sticking together. 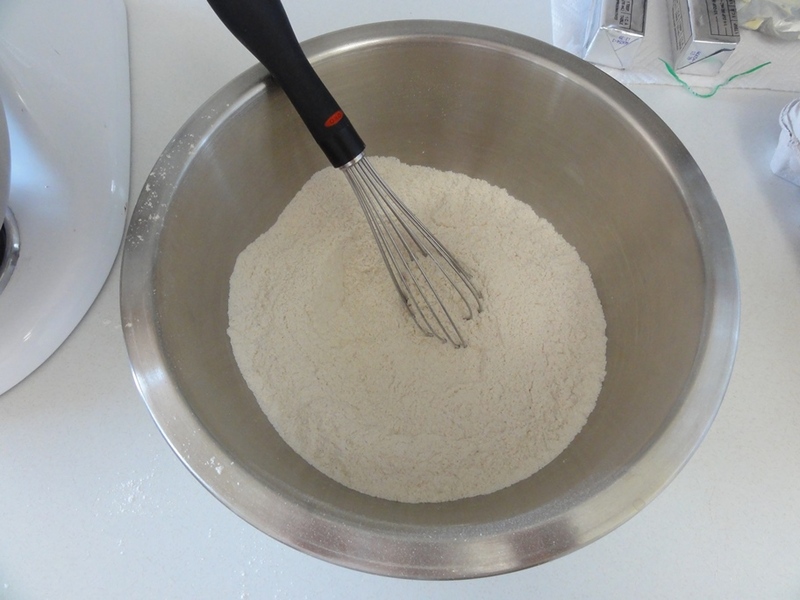 When it came time to fold them in, I used a large fork to sift the pieces out from the excess flour. 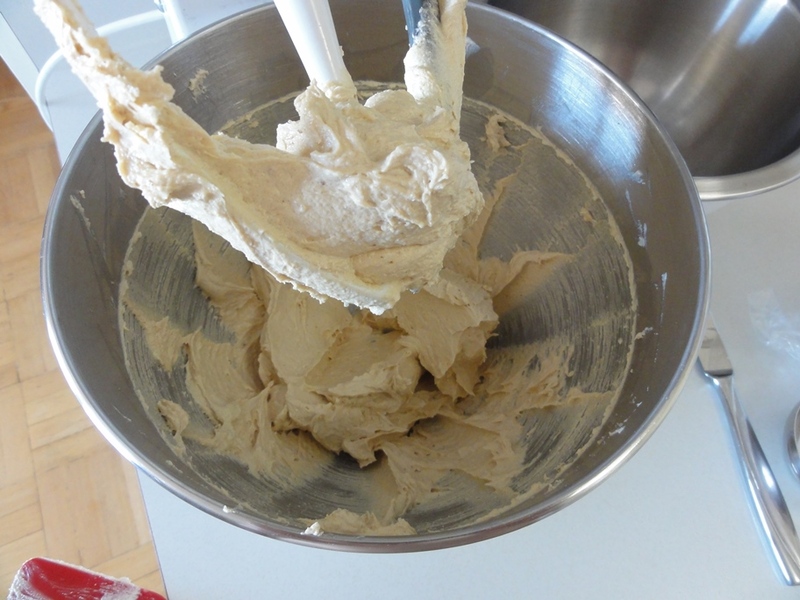 Moving on…cream your butter and sugars together to a fluffy consistency. Then add your egg and vanilla. It helps if the egg is at, or close to, room temperature. 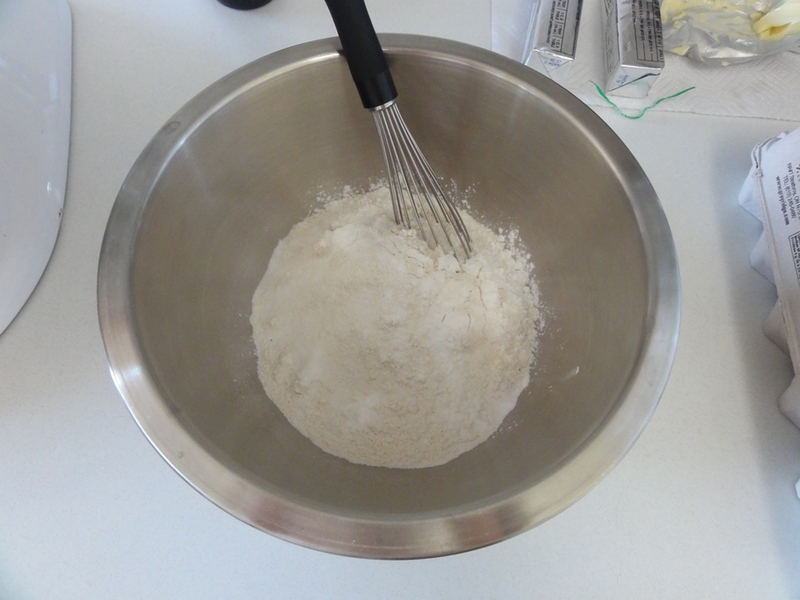 When whisking the dry ingredients together, your baking soda and cornstarch serve well as an indicator of when everything’s thoroughly mixed together. Once you no longer have spots of white and everything in the bowl is approximately the same color, you’re done! 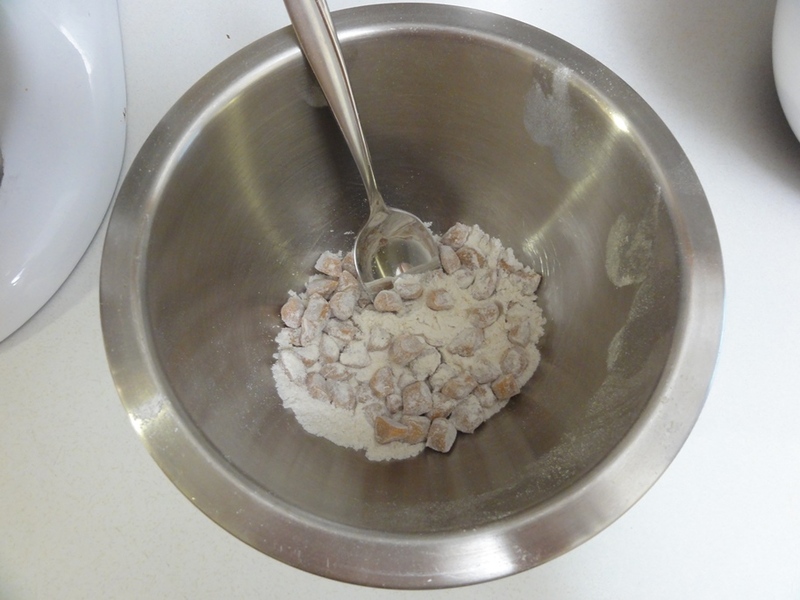 I apologize for neglecting to take a photo of mid-way through mixing the dry ingredients to the wet, so I only have the end result of this next step, but I used a 1/3 cup measuring cup to scoop up dry flour mixture and add it to my stand mixer’s bowl while it was running on low speed. That worked well to blend everything together evenly. 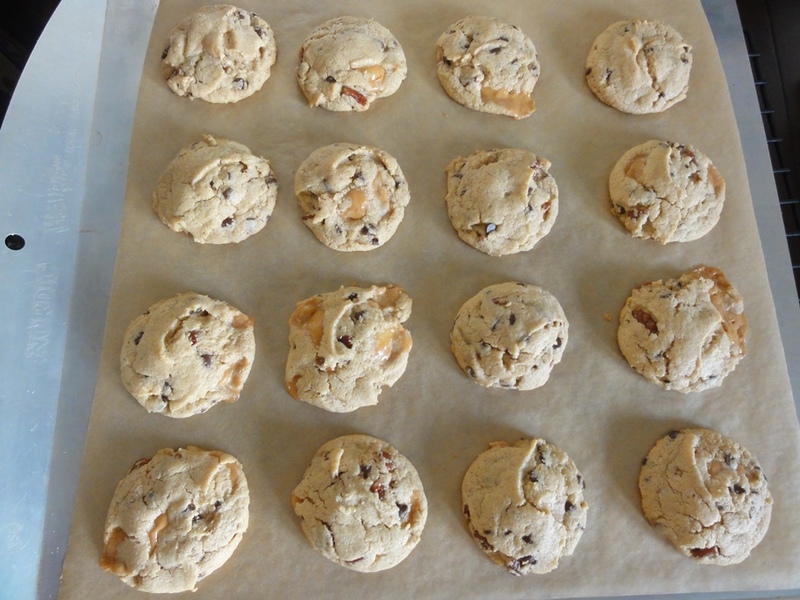 Then you can fold in the chocolate chips, caramel pieces, and pecans, and then chill the dough in the fridge so that it’s a little easier to work with and the cookies will better hold their shape while they’re in the oven. 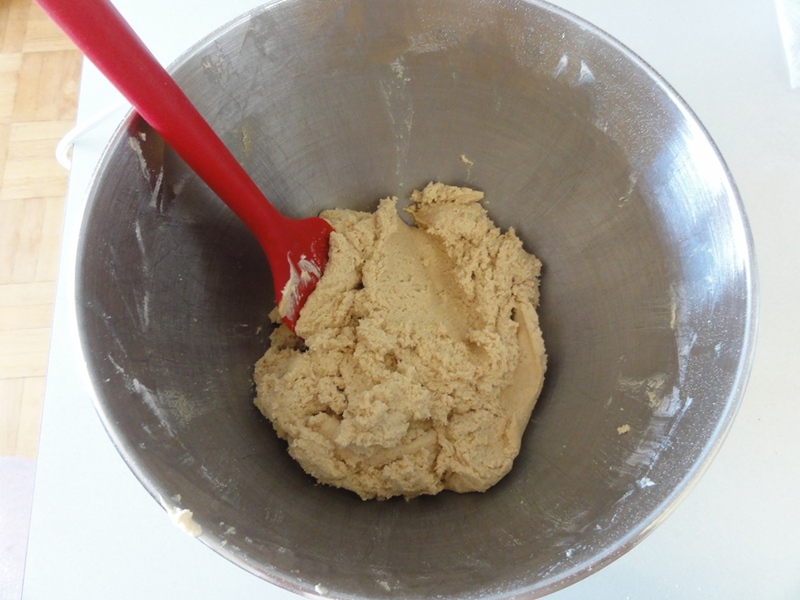 Even after being chilled, the dough will still spread out in the oven so give your cookies plenty of room. Expect also that your caramel pieces will melt out of a few of your cookies. 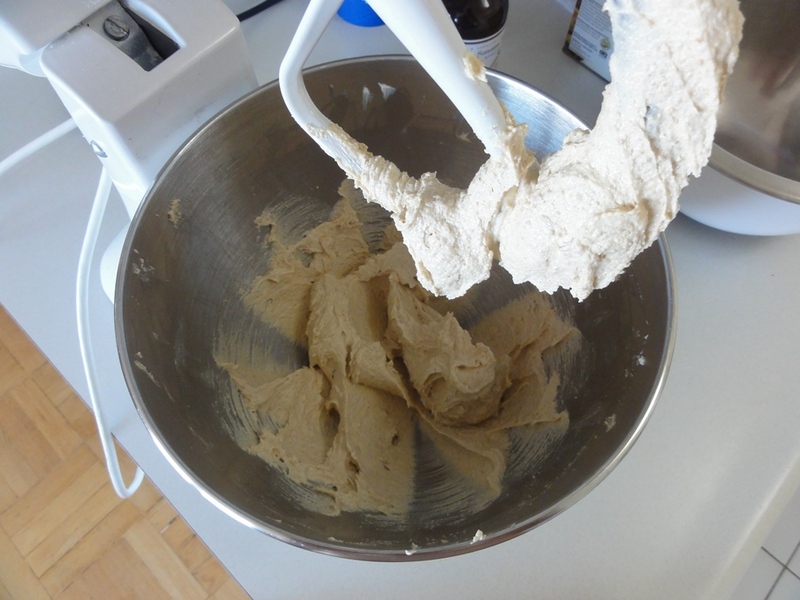 The cookies are done when the edges are just starting to turn browner than the dough on top. Once they’ve cooled, any liquid caramel should have set up, and you can have yourself a plate of chewy caramel chocolate chip pecan cookies!